Is your dull, dreary cubicle dragging you down? It's not all in your head — studies show that environment has a major influence on mood, which has a big impact on productivity. Here are our favorite ways to personalize a soulless workspace. Cover up that depressing grey fabric by thumbtacking posters, framed art, wallpaper, gift wrap, a calendar, a wall clock, etc. Other ways to hang decor include over-the-rail hooks and clothespins on swags of string. Just make sure none of your hang-ups are NSFW. Pick one or two colors and use them to coordinate everything from your pencil cup to picture frames. If you can't find the color you want, get a can of plastic paint from the craft store. How many things can you create with clips? Look what this guy did! 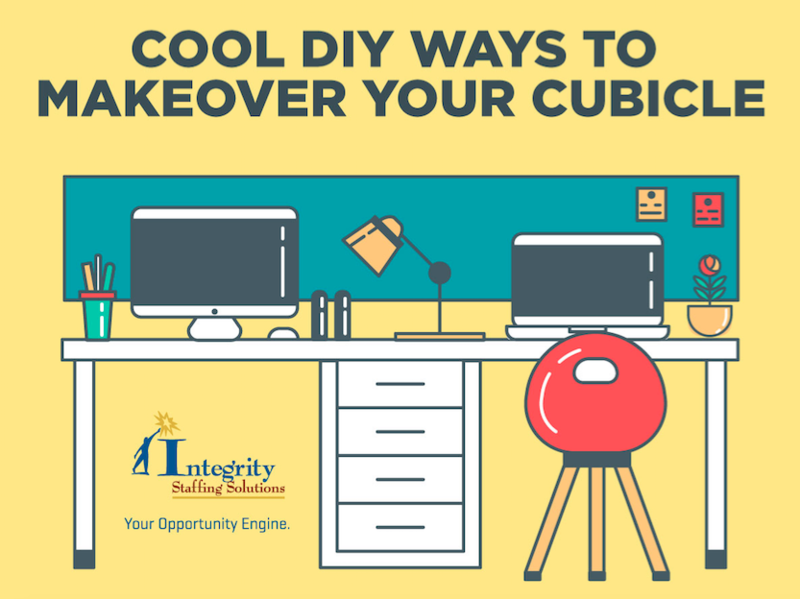 Metal and plastic parts such as your desk or computer can also be jazzed up with removable products that won't damage paint. Painters tape, washi tape and peel-off decals all come in loads of styles and colors. Add a lamp, fan/space heater (depending on whether your office is too hot or too cold), lumbar support pillow or throw rug. One thing NOT to bring is candles — we have seen them set off the smoke alarm. Potted plants don't just look good, they add oxygen to the air, which could improve your mental sharpness. Choose a variety that can survive neglect, such as the ones on this list. Or if you're going for an elegant look, bring in a vase of cut flowers. 2D or 3D designs ... the only limit is your imagination. This compilation shows how extreme you can get. A quick browse on Pinterest will show you thousands of other ideas. Just remember the cardinal rule: don't do anything that permanently changes or damages the office equipment. After all, it belongs to the company, not you.